After playing with my friend Jim's Makerbot for some time, I realized that I simply had to have one of these. However - having a moving build platform really limits the speed and usefulness. I researched what machines were available and they all had similar limitations. Either they were too flimsy or had a moving build platform. 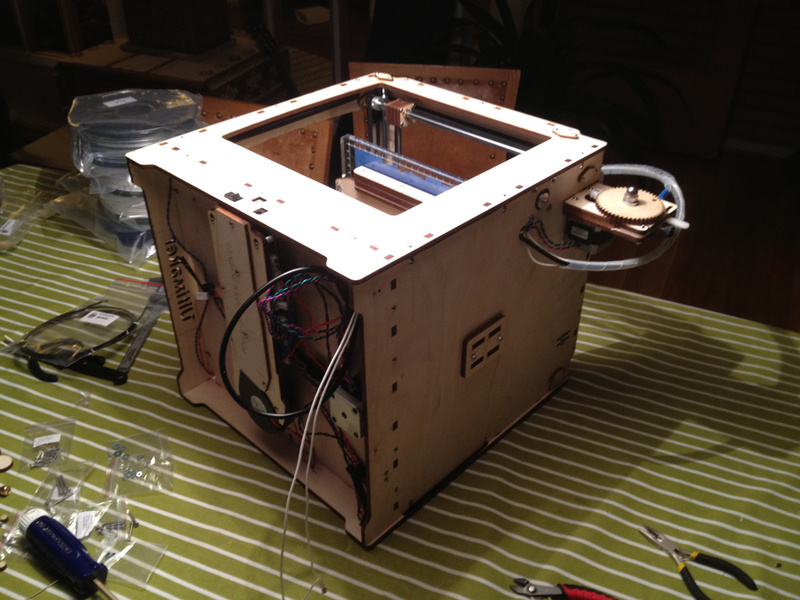 Then I found the Ultimaker. It has a build platform that only moves up/down. The X/Y axis is moved by double belts pulled by the same axis and it can run at crazy speeds. The material feeding system also looked a lot better than on the Thing-o-Matic. I hit the buy-button and got the printer only 20 days later - not bad given that others have more than 6 weeks lead time. I read that it would take a full day to assemble it, so I prepared my family that I was going to be somewhat busy one of the days ahead. The package stood idle while I waited for an opening in my work schedule. It's not that often that I buy "toys" that cost €1200 so I figured that I wanted to combine the build experience with another hobby. While building the printer this friday, I did a timelapse (still to be edited) of the whole build process (like many others). It really took a full day. I started at 9:00 and ended at 23:30 - without having printed a single thing. I could have done it in 3-4 hours less, but there were some issues while putting it together. I'm also a family man so I also set aside some time (not much) for dinner and playtime with the kids. Putting together the case and endstop switches took about an hour. I then moved on to the X/Y motors, belts and pulleys (about 2 hrs). The most elaborate part is the print head and X/Y axis. This took almost 3 hrs. The build platform came next and that took about one hour. Next was the material feeding system and that was my first problem. Before complaining, I should add that the people at Ultimaker are hobbyists that put together a good machine and now sells it commercially - with a BETA-tag on the name. The machine sells with a disclaimer that says that this really is a kit and you must be sure that you have the skills required to assemble it yourself. Interest has been crazy and they're working hard to scale up their operation to handle the interest. The problem is that the product is still very much under development and it's nowhere as polished as Makerbot Industries that has been in business for quite some time (Last number I saw for Makerbot was 80 fulltime employees). 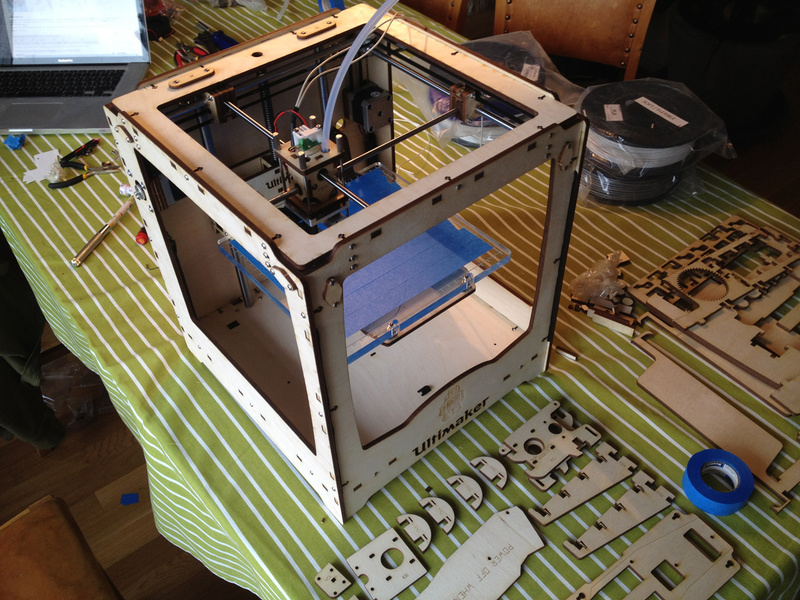 The Ultimaker team surely has growing pains and getting the logistics right is probably a solid learning experience. So - what went wrong? Apparently they didn't have the correct Hex nut's and washers available and someone made up a quick solution. However - they didn't test this and there is no way one could mount the supplied washers/nuts with the special hobbed bolt so that it would move the print material forward. The washers supplied were simply too big, so they prevented the ball bearings from rotating. After some testing and thinking, I popped off to a local hardware store and picked up some washers with the same 8mm inner dimension, but with a narrower outer dimension. Worked like a charm! I could not believe it when I saw it - they had forgotten to add the stupid cable with my power supply? Normally that wouldn't be an issue, but they use this stupid kind of grounded plug that is shaped like a clover. After some searching, I called around and went off to my dad to pick one up. I plugged it in and was told that I had to update the Ultimaker firmware from version 0.1 to 1.0. It's easy-peasy it said - just select it in the menu. That didn't work but I still wanted to try printing… I loaded up a model in ReplicatorG and BRRRRRRRR - the steppers slammed the print head into the edge with no sign of stopping. Ok. That's enough for one day I thought and went to bed. Today I've been printing all morning and eve, but I'm not really at a point where I have something solid to show. I can't really bend ReplicatorG to print anything other than the test-cube and it can only print it at 1x speed. If I try to print it at 200% speed, the build just stops after a relatively short time. No warning, no nothing. It just stops? (Update: this is a bug in USB/serial comms on my Mac. It works flawlessly on a PC so now I'm using that) Loading other models defaults them to the front, left corner no matter where I place it in the program. I'm currently experimenting with using Slic3r to make the GCode instead. It looks MUCH more solid but on all bigger models I have a problem with the build just stopping? I think I need to try another firmware. Overall, I'm incredibly impressed by how well the machine is built. Every little detail like the build surface leveling, the nice cable ducts, how all moving parts are really solid, the material feeding, the precision laser cut parts and certainly the speed and resolution that the printer can produce compared to the Makerbot Thing-o-matic. I'm working on a short post highlighting the differences between these two. You'll need a wrench, a stanley knife (or similar), tweezers, a tiny screwdriver and some plumbers tape. Luckily I had that last one around, but I think the Teflon-version is probably better as I have a small leakage around my nozzle. Improvisation is required - just as the disclaimer says "in some cases you can get better results if you have some improvisation skills"
Most Ultimaker users are PC people. While the Mac software exists, it's probably not too well tested so if you have a PC - use it rather than the Mac. Looking forward to further explorations in the days to come! Those that know me well, will know that I have a desire to know as much as possible about things and Arduino is no exception. One evening I was browsing around for things to buy, I stumbled onto this site called Emartee. 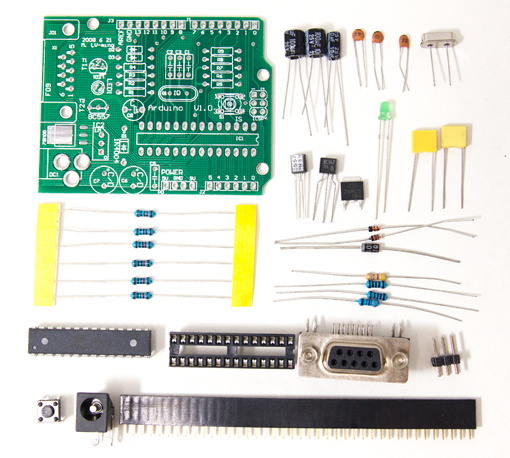 It's a well updated site that also has some of those obscure things such as really well put together Arduino starter kits. These would be great for both a workshop as well as further explorations. These base components cover what most people need while exploring and just add a servo, a display or the sensors of your choice to get a full kit. Some months ago, I found a Portugese shop that still offered the random colored PCB versions of the Duemilanove (2009). The Duemilanove is great to have around for burning bootloaders as this can be hard to do with the newer Uno boards. However - while browsing Emartee I found something that looked older - it said that it was a Arduino Diecimila Kit but it looked a little different. According to the Arduino overview of older boards - the Diecemilia (means 10k in Italian) was supposed to have a USB connector but this package had a good old Serial cable with it? I bought it on impulse - just to see what it was. Today the gear I ordered arrived and boy was I surprised! In an antistatic bag there was a PCB that said "Arduino 1.0"? In the bag was no ATmega168 chip as it said on the Emartee site, but rather a Atmega8? This was fun! After some googling I now know that what I bought is a kit to build the first version of the Arduino Serial - designed in 2005. I had initially planned to relax and solder this up tonight, but I think I'll just keep it as a bit of Arduino history. I don't have a PC with the required Serial port around the house so I couldn't use it even if I wanted. Today I've been playing around with SMD soldering using a tiny little touch-sensor called IQS158. I got hold of a soldering kit from Proto Advantage for MSOP-10 and started soldering away. When it came time to test it, I realized that I had never really used I2C before, only SPI. Aw bummer... How to figure out if my soldering actually works? Then I remembered that I picked up a triple axis accelerometer breakout from Sparkfun some weeks ago. I could test with that one and then base my code for the touch sensor on that? The breakout is based on the ADXL345 chip and supports both SPI and I2C. Sparkfun only had SPI examples, but I found a link to Builder.org on the product page that had a the perfect I2C tutorial for my breakout. It was based upon a library that wasn't updated for Arduino 1.0. They have a patched version in the article, but I did my own patch to learn and posted it to a new Arduino repository on GitHub. I'll place all my code in this one from now on. In the repository, you can also find a "bare bones" example file that is using the breakout/ADXL345, but without the entire library. This file only prints the x/y/z coordinates to Serial, but it also makes it really easy to see how much value the library adds such as detecting taps, freefall and lots of adjustment options.